The Caperton Planetarium and Theater has been re-imagined! Upgraded Planetarium software has resulted in a huge improvement in brightness and resolution, with crisp images, sparkling stars and stunning details! In technical terms, the new projection system will display 30 million pixels, 60 times every second on the dome! In addition to the amazing upgrades in picture quality, the new technology also brings the ability to showcase a variety of films and presentations in 3D! The 3D views are provided to the audience by utilizing active 3D glasses rather than the polarized lenses you would find in a regular cinema. 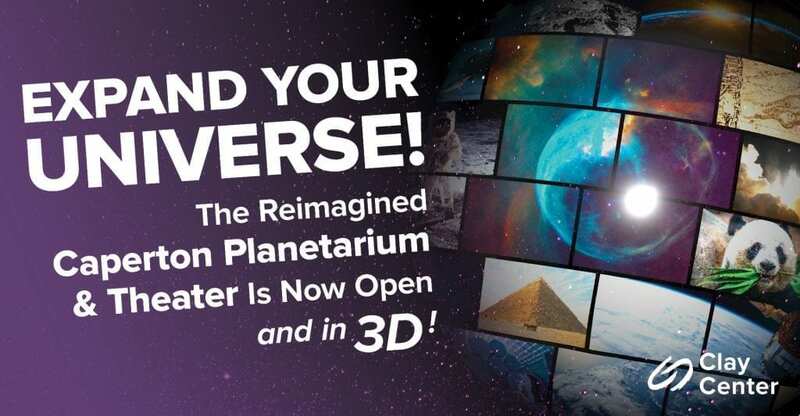 The Caperton Planetarium & Theater is open Thursday – Sunday weekly with shows beginning at 12:00 PM. Cosmic Adventure – This show for families takes us on a roller coaster ride from the moon through the universe, our galaxy and our Solar System. This unforgettable high-speed adventure will immerse you in some of the most amazing sites in the Universe. Narrated by Nancy Cartwright of TV’s The Simpsons. Pandas – Pandas are a lovable, iconic, and — unfortunately — highly endangered species. In Pandas: The Journey Home, meet the dedicated team working tirelessly to save these captivating creatures from extinction. Filmmakers were granted unprecedented access to the China Conservation and Research Center for the Giant Panda to tell the story of our furry friends. The pandas’ fascinating habits and unique personalities will leave you with a huge appreciation for the animals and the individuals working to protect them. Witness an incredible story of survival and fall in love with these black and white gentle giants. Showing in 3D! Live Presentation – Take a tour of our local Solar System and enjoy a breathtaking flight through the rings of Saturn in this live presentation. Watch ice particles encircling the planet seemingly jump out from the dome above and hang in front of your eyes on this voyage to the stars! National Parks Adventure – Narrated by the incomparable Robert Redford, National Parks Adventure takes audiences on the ultimate off-trail adventure into the nation’s awe-inspiring great outdoors and untamed wilderness. Immersive cinematography takes viewers soaring over red rock canyons, hurtling up craggy mountain peaks and into other-worldly realms found within America’s most legendary outdoor playgrounds. Humpback Whales – Narrated by two-time Golden Globe® nominee Ewan McGregor, Humpback Whales is an extraordinary journey into the mysterious world of one of nature’s most awe-inspiring marine mammals. Set in the spectacular waters of Alaska, Hawaii and the remote islands of Tonga, this ocean adventure offers audiences an up-close look at how these whales communicate, sing, feed, play and take care of their young. Join a team of researchers as they unlock the secrets of the humpback and find out why humpbacks are the most acrobatic of all whales, why they sing their haunting songs, and why these intelligent, 55-foot, 50-ton animals migrate up to 10,000 miles round-trip every year. Showing in 3D!